The world always seems so full of mystery and excitement as a child and after growing up, we realize that childhood is fleeting and wish to instill in our children the same excitement we experienced as young children. This charming yet intense picture book details the story of a girl who discovered the mystery and excitement in the world around her until one day something happens that makes the girl take her heart, her desires, and her excitement and hide them away where no one can ever find them and growing up won’t change them. 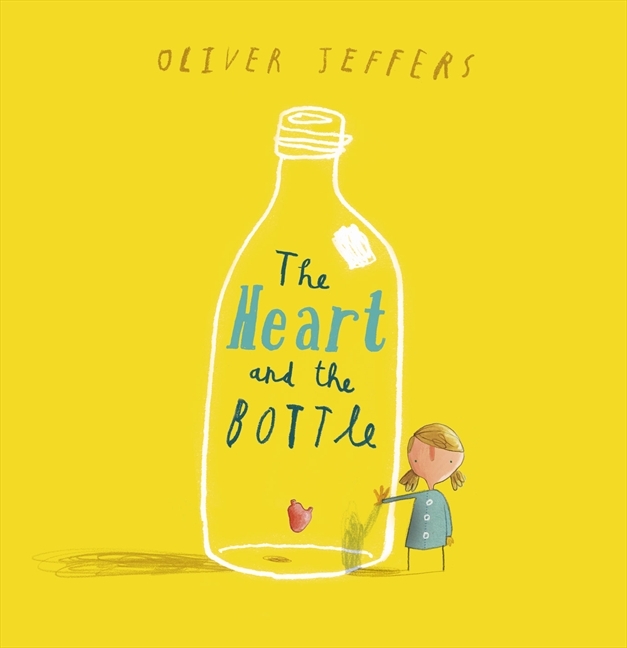 In his book, Oliver Jeffers tackles the heavy themes of life, love, and loss and shows us that there is always hope if we can just find the simple joys in life and share them with the people around us. Jeffers encourages the reader to come up with their own story. Is there anything in life that is preventing us from fully experiencing the wonder around us? I believe this book can be enjoyed by both children and adults alike. While some concepts may seem too difficult for a child to understand, don’t discourage them from reading the book. They may discover something from the story that adults sometimes fail to do because they can’t remember how to look at the world through the eyes of a child. Read reviews, click here or here! When Mary Faber’s gang of street orphans runs into problems, Mary decides that it is time to change course—she dresses as a boy and manages to sign on to a Royal Navy ship as one of six new ship’s boys. 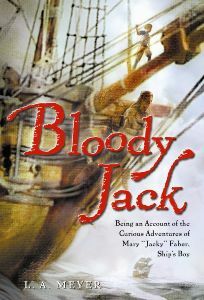 This first book in the Bloody Jack series follows Mary (now Jacky) through a number of sometimes unlikely, but always entertaining adventures, from getting a Brotherhood tattoo with her fellow ship’s boys in Jamaica to getting carried away by a giant kite and captured by pirates. Along the way, she falls in love (a complicated thing when one is dressed like a boy! ), and struggles between the necessity of maintaining her disguise and the wish to escape its limitations. Bloody Jack, and the rest of the Jacky Faber series (the tenth novel was released this past September) are full of adventure and carefully researched history that thrusts readers into many of the major events of Jacky’s time period. Readers can follow Jacky into the Battle of Waterloo, down the Mississippi river, to a penal colony in Australia—Jacky does have a knack for getting into trouble—even undercover as a spy in France. Although Jacky’s devotion to the love interest introduced in Bloody Jack remains (mostly) steady, the stories remain focused on Jacky’s ability to get herself into and out of predicaments, and on the growing collection of complex and often admirable people she claims as family. The audio books, narrated by Katherine Kellgren, are consistently excellent and add new dimensions to the stories. Read a review of the novel here and one of the audio version here! Check out the author’s website, where you’ll find all sorts of background material on the novels—maps, songs, even outtakes. Read about Katherine Kellgren, the award-winning narrator of the Jacky Faber novels here. Bloody Jack is written by L.A. Meyer, who holds the copyright for the title. It is published by Houghton Mifflin Harcourt. Ingathering tells the stories of the People, from their arrival as refugees in the southwestern US until the choice, generations later, to join their kind on a colonised planet or claim Earth as their home. The People have a painful past on Earth, persecuted at first for their differences (they have a number of powers, both general–like flying–and individual–like the ability to draw another’s pain into oneself) and isolated in scattered communities more recently. However, the stories are presented as told to outsiders, and demonstrate that often the People have found ways to build positive relationships with their human neighbours. Those connected to others like themselves (the title refers in part to the gradual ingathering of the refugees and their descendants into communities) frequently do best in this regard: having found a place of belonging, they are better able to reach out to others. This collection brings together stories previously published in Henderson’s Pilgrimage (1961) and The People: No Different Flesh (1967), as well as a handful of others that had appeared elsewhere, and makes readily available a body of work that had become rare. 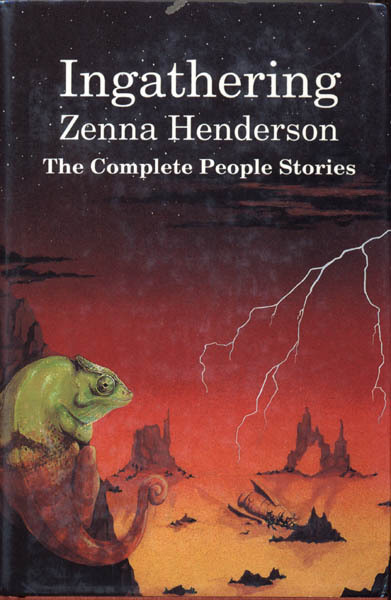 Though the world in which they live is familiar enough (at least, as familiar as the American southwest in the 1960s is to the reader), Henderson does an excellent job of creating a people with its own rich history and culture. The sense of otherness and the hope of community combine to make this a compelling read for anyone who has felt alone. Check out a review by Jo Walton! And another from a very different perspective. The presentation is dated and the review is very long, but the analysis is frequently insightful. 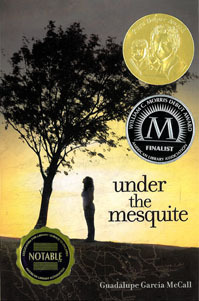 Under the Mesquite, written entirely in verse, accompanies Lupita through her family’s immigration from Mexico to the US and her mother’s struggle with cancer. The family starts out well—close-knit, careful with their money and eager to establish themselves in their new home. As a stubborn mesquite tree (a symbol that proves to have multiple meanings) claims a home in her mother, Mami’s, rose garden, though, Lupita’s family itself is invaded and nearly overcome by Mami’s illness. Their savings are drained, Lupita’s father becomes distant, and Lupita herself — in her last year of high school — takes on responsibility for tending her seven younger siblings while her parents spend weeks with a specialist in another city. Ultimately, however, the hardships faced strengthen the family. Lupita closes her story with convincing hope in a new beginning. Because the family moves only a short way across the border, the story shares Lupita’s experiences in a new country and her family’s frequent visits back home. For most readers, then, the novel offers both the familiar (American culture) from an outsider’s perspective and the unfamiliar (Mexican culture) from an insider’s perspective. Although the novel is written in first person, Lupita makes references to poems that are not included, suggesting that what the reader sees is not Lupita’s poetry, but her thoughts. The language is often breathtaking, demonstrating the author’s gifts not only of expression, but also of profound insight into the experiences that she describes. There is deep truth to be found here. Read reviews from School Library Journal, Lee & Low Books, and slatebreakers. Note: There was a problem with the original post for this date–this is a replacement to keep the space filled. Our review of The Heart and the Bottle will be reposted next week! Marcus Sedgwick, author of White Crow, My Swordhand is Singing, and Floodland, has kept up his blog since July 2008, with the first entry including a gloomy Swedish poem about death with no translation available until two days later. His posts include information about tours he has gone on with no updates while he is on the tours, glimpses into his writing process, teasers of upcoming books, information about projects he is currently working on, and pictures from trips he has gone on to research for any books he is currently writing. Links along the side provide information about his most recent book and access to the official Marcus Sedgwick Facebook group, his twitter feed, and his website. Unfortunately, Sedgwick’s blog is not updated frequently, with only ten posts in 2012. His posts are quite short and usually allow his readers a glimpse into what he is currently working on by the abundance of photos and even videos. A recent post encourages readers to write for themselves and not let anyone push them into writing: a reminder that it was first (and still is) a hobby before it became more of a career. The blog is written for mostly adults in mind; however, young adults can easily read and feel comfortable with his blog posts as well. There is little evidence of community within the blog with only a few comments on his blog posts, if any, and only fifty active followers of the blog. Based on his posts, Marcus Sedgwick is quite busy with his many projects, his latest being an interactive theatrical experience of his novel My Swordhand is Singing. Samar’s mother is determined that she and her daughter will fit into their community as thoroughly integrated Americans. She has cut off contact with her strict family and avoids involvement with the Punjabi culture and Sikh religion within which she herself was raised. Samar, who goes by Sam, does not question the way she and her mother live—she remembers being bullied as a child for being different, and she feels comfortable with her white friends and typically-American lifestyle. Then, just after September 11, 2001, her estranged uncle arrives on her doorstep, offering access to a heritage that Sam might want after all. As she grows more interested in exploring that heritage, and getting to know the people connected to it, Sam runs into conflict with those already in her life who prefer things as they are. 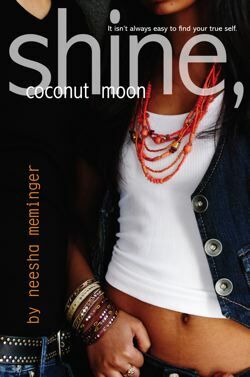 Set in New Jersey in the months immediately following 9/11, Shine, Coconut Moon provides insight not only into the conflict between heritage and home experienced by the children of immigrants, but also into the experiences of those who looked, to ignorant and frightened eyes, too much like the people responsible for the recent attack. The gradual revelation of the events that led to Sam’s mother’s decision to avoid her heritage and Sam’s stubborn investigation into what she’s been missing—from visiting a Sikh temple and making friends with the Indian girls at school to seeking out her grandparents—is engaging, while the setting reminds the reader just how much was changed by 9/11. Find reviews here, here and here. Watch book trailers here and here. Check out the author’s website here. 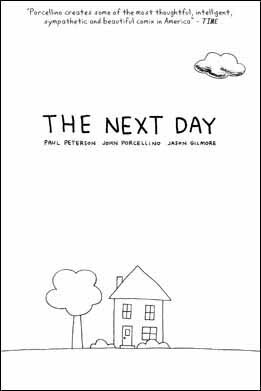 The Next Day is a graphic novella and interactive documentary that recounts the stories of four people (Tina, Ryan, Chantel, and Jen) who have contemplated and survived near-fatal attempts at suicide. The stories are taken from personal interviews and intertwine to form an almost escalating spiral to the end until the next day when a bit of hope peeks through the darkness and shows what can happen if you find the courage to wait just one more day. 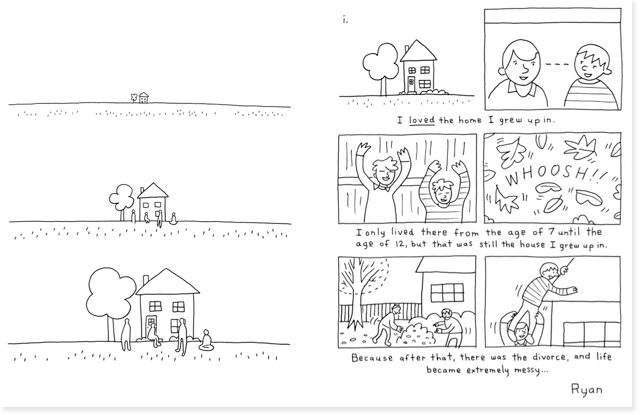 The graphics that accompany the text are powerful yet simple line drawings that convey the despair that can accompany mental illness and depression. The graphic novel is a collection of four powerful stories that captures key moments from each of these four people’s lives that led them to make the decisions they did. The online interactive experience recounts the same stories but it allows the user/reader to listen to the stories first hand through the original audio interviews. The book, while found in the YA section of my local library , can be most appreciated by older teens and adults. I would recommend this book to anyone who is trying to understand what goes through the mind of someone who has committed or is contemplating suicide. For books reviews of The Next Day, click here or here. To view an interactive version of the book, click here. Citation of Image: Image from Book. Found on http://torontoist.com From The Next Day, Gilmore, J., Peterson, P., & Porcellino, J. 2011. Toronto: Pop Sandbox.